Jenny Dalzell Ouellette is the public relations manager for Spoleto Festival USA and a frequent contributor to Dance Teacher. Irene Dowd's third-year students at The Juilliard School sound more like they're in medical school than a dance class, citing complex kinesiology terms and muscle names, like multifidus and iliocostalis. But instead of memorizing the vocabulary with index cards and textbooks, the students in Dowd's anatomy/kinesiology class come ready to move. “Motor-learning specialists have found that we learn by doing," says Dowd, who began teaching at Juilliard as an assistant to ideokinesis matriarch Lulu Sweigard in the late 1960s. “If you learn it [anatomy] intellectually, you forget it. You have to do it physically, and then you can start to understand what you've learned." The ankle joint can only move about 25 degrees outward and 35 degrees inward from a neutral position. Why does that seem hard to believe? Because in a dance context, these minute motions have huge aesthetic effects. They can punctuate the line of an arabesque, elongate a tendu—or indicate a lack of training. Many of Abigail Agresta-Stratton’s students go on to study dance in college. When her teaching hours dropped roughly 38 percent between September 2011 and June 2012, Abigail Agresta-Stratton had an inkling. New York State school dance programs were being cut left and right, and dance teachers—only some of whom are covered by tenure—were losing jobs. Although Agresta-Stratton had built the West Islip High School’s program from the ground up in 2006, by spring of 2012 she was out of a job. Though she claims she had a “woe is me” moment, it couldn’t have lasted long. By fall, the former president of the New York State Dance Education Association was holding the reins of the dance division at Chesterfield Specialty Center for the Arts at Thomas Dale High School in Chester, Virginia. Still, she’s jumped right in: She’s on the board of the Capital Region Educators of Dance Organization—the National Dance Education Organization’s state affiliate for Maryland, DC and Virginia—and is working to increase membership and has started an online forum for members. 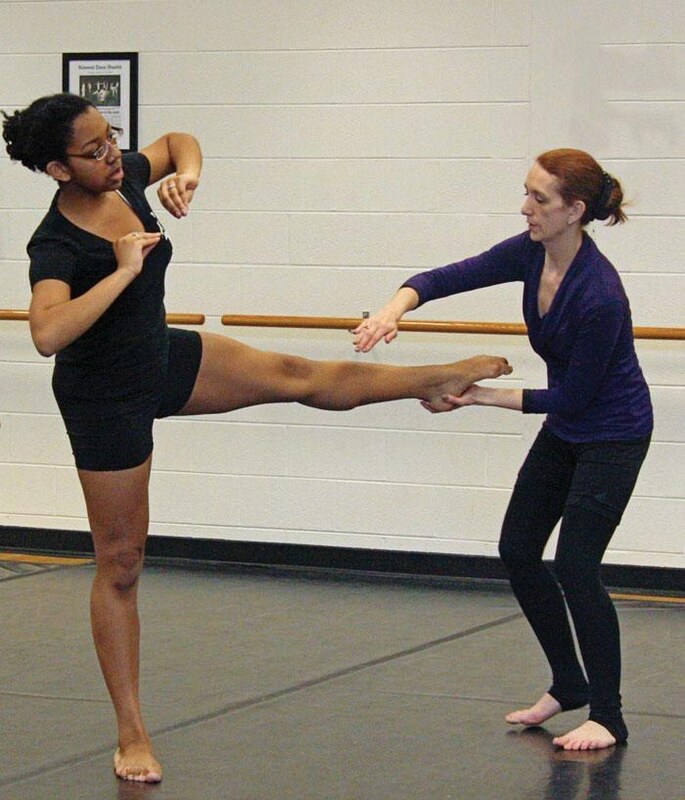 She’s also piloting a new program in partnership with NDEO: Chesterfield Specialty Center for the Arts is the first high school to house NDEO’s dense dance education research database, DELRdi—something typically used by university programs. Courtney Runft and American Tap Dance Foundation student Julia Freer (age 5) demonstrate a maxi ford. 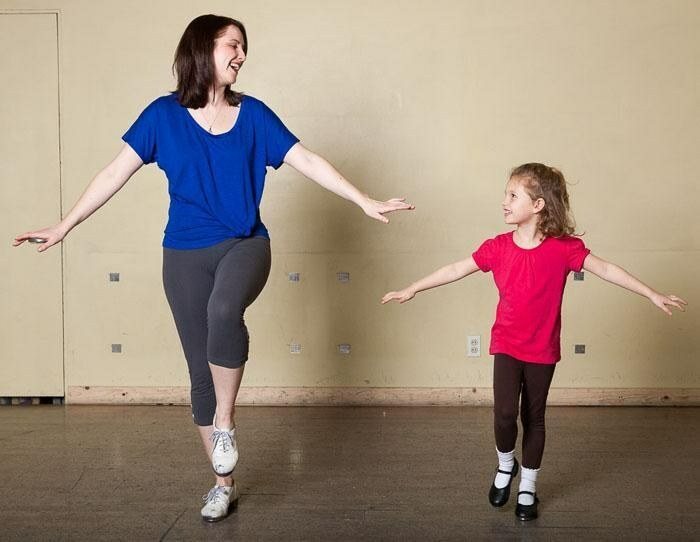 Forty-five minutes of 3 1/2-year-olds in tap shoes may sound like a recipe for a throbbing headache, but Courtney Runft manages to keep the noise under control. That’s because for the first few months of her pre-tap class at the American Tap Dance Foundation, students wear sneakers. “We learn classroom etiquette,” she says. “For most of them, it’s the first time they’re in a classroom, and they don’t know how to take turns, stand patiently or follow directions.” The noise level rises when the taps are first introduced, but the students quickly learn to control their feet. “I’ll point to them and let them make all the noise they can, and then make the signal for freeze,” she says. “We play noise/no noise, and they get used to it.” Like most skills taught at this level, standing quietly becomes a game. Runft also co-directs the Tap City Junior Ensemble and teaches adults at ATDF, but it’s the youngest levels that keep her on her toes. “It’s the hardest class to teach because you have to think quickly,” she says. “As soon as I lose one person’s attention, it’s time to move on and switch gears.” Runft, who helps shape the school’s curriculum, has roughly 11 tap activities in her arsenal for pre-tap—including a “scrambled eggs” counting and moving game, hopscotch and a stage-direction challenge—and she goes through more than half of them each class. A conversation with the host of “So You Think You Can Dance"
With Season 10 premiering this month, Dance Teacher caught up with the two-time Emmy-nominated host for a behind-the-scenes perspective on America’s favorite dance show. 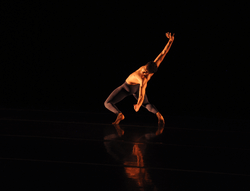 Dance Teacher: What’s most challenging about hosting “So You Think”? Cat Deeley: Because the show is live, the most difficult thing is keeping it on track and not getting lost in the moment. There are many elements and emotions run incredibly high. We have to be in the moment, but I also have to be able to extract myself to keep the show moving. I’m the ringmaster, juggling lots of different balls to make it entertaining and enjoyable for everyone watching at home. DT: How much are the producers feeding you instructions? CD: Actually, I do my own thing. I’ve got a clock I can see so I know where I can take my time or move on. Quite honestly, the producers can’t see everything I can see at the same time, so they let me get on with what I fancy, unless we’re going really over on time—usually because the judges are talking for too long. Then they’ll scream in my ear, “You’ve got to move them on; you’ve got to move them on!” which is much harder than it looks. DT: Who taught you to deal with the pressure of a live show? CD: Voice coach Peter Settelen, who helped me with public speaking, always said, “Be in the moment.” The biggest thing I learned was preparation. Prep, prep, prep, and go to every rehearsal. I think this can be said for any kind of performance. Do everything that you possibly can, so that when you’re live, you can throw away the preparation. I know what camera I’m speaking to, what spotlight to be in, where this dancer needs to be and how long we’ve got on the clock. So when the judges are commenting or the dancers are reacting, I can truly be in the moment. DT: What have you learned about dance? CD: When I was little, I’d see The Nutcracker at Christmas. It was beautiful and the dancers could do amazing things with their bodies, but it never really moved me. On the show, though, there are incredible moments when you get the right choreographer with the right dancer and the right hair, makeup, costumes, lighting—the right amalgamation of all those factors—I can’t describe it. I’ll get the chills and the hairs on my arms stand on end. I’ll go onstage after the piece and look out into the audience, and people are mesmerized. Dance can absolutely move you both physically and emotionally, and I didn’t realize that until this show. DT: You’re known for being a fashion guru. How do you assemble your wardrobe? “Macaroni and cheese is still my favorite food—how would I know who I want to hook up with?” That’s Nate Foster, the 13-year-old protagonist of Tim Federle’s young readers novel, Better Nate Than Ever, responding to a bully who taunts him about his sexuality. Whether you use the book in class as a discussion starter, or share it with students at your studio, this is a must-read for all middle school–age performers. The story follows Foster, who secretly takes a Greyhound bus from his small-town Pittsburgh suburb to New York City to audition for E.T. : The Musical. But it’s more than an adventure through Manhattan. The coming-of-age tale sheds light on real themes: bullying, sexuality, family and self-discovery, all from the hilarious and loveable perspective of a musical theater–obsessed teen. Most compelling is the realism within the pages. From the New York City landmarks—like Ripley-Grier Studios and a walk between the Flatiron Building and SoHo—to the scene at a new musical open call, Federle gets it right. 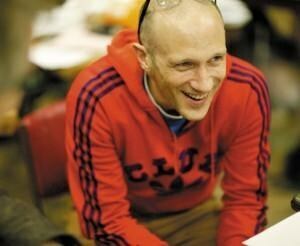 He’s a Broadway dancer and former coach of the Billy Elliot kids; his childhood mirrors his protagonist’s. 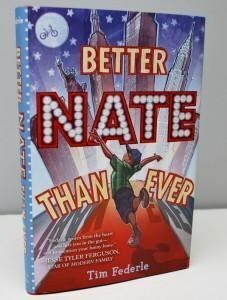 (According to Federle’s biography on his website: “1987: Tim develops interest in the musical Cats; 1988: Bullies develop interest in Tim.”) Federle’s sharp wit successfully captures the voice of a precocious, but unsure young teen, while appealing to adult readers as well. You won’t be able to put it down. Peter Darling doesn’t consider himself a whiz when it comes to working with children. “I suppose I just think of them as very small adults,” he says candidly. But the British choreographer is clearly doing something right. 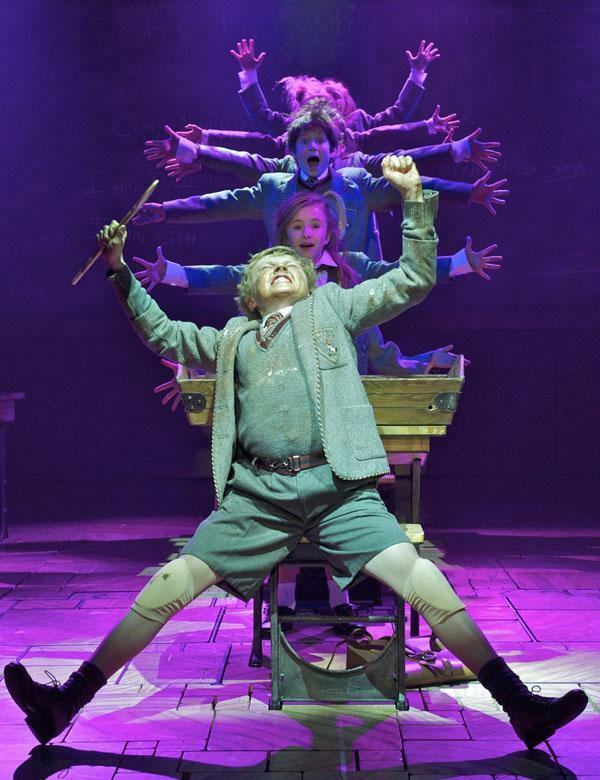 He took home the 2009 Tony Award for his work in the kid-centered musical Billy Elliot (nine years after he choreographed the Oscar-nominated film), as well as the 2012 Olivier Award for best theater choreography in the original West End production of Matilda The Musical. This month, Darling brings Roald Dahl’s classic tale to life on Broadway, opening with a new children’s cast at the Shubert Theatre. Directed by Matthew Warchus, the story follows hyperintelligent Matilda, whose newly discovered special powers help her navigate a world full of terrifyingly nasty adults. Dance Teacher spoke to Darling about his choreographic process and tactics for getting the most out of young performers. 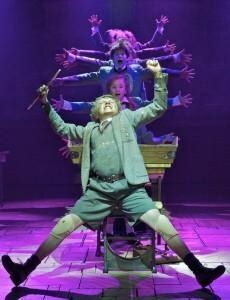 Dance Teacher: Were you familiar with Dahl’s work before you were asked to choreograph Matilda? Peter Darling: I’ve always loved Roald Dahl, and I think it’s [Dahl’s work] very me in terms of how it’s abrasive, but also funny. And it’s about something real. There aren’t saccharine elements to it; it’s not pretend. Although his work—like James and the Giant Peach or Charlie and the Chocolate Factory—often deals with heightened situations, the underlying themes are real. DT: How did you go from book to dance? Where did your process begin? PD: I looked at a lot of the images by Quentin Blake, who does Dahl’s illustrations. There’s sort of a spiky, stretched-out quality to all of the drawings. I also spent about a week at a primary school, trying to find a common denominator in all of the children. For me, it was their fidgeting. They never stop moving. Even in their attempt to be still, there’s always a scratch or a shift. That’s where the kids’ movement was derived. DT: In rehearsals, do any of the more precocious kids ever make choreography suggestions? PD: Not often. Because I’m interested in children doing quite complicated work, I don’t start with them as the models. But they are able to replicate the work in an extraordinary way. DT: You’ve said that after auditioning thousands of children, you know very quickly who you want to cast. What do you look for? PD: The ability to attack movement, and the ability to express themselves through movement. I want to see that their movement isn’t divorced from their brains. When you’re teaching dance, give a narrative. It will help them understand why they’re doing whatever they’re doing. In life, we don’t move without motivation. So in a musical, why would anyone move without a reason or intention? My job is to see how they respond when I give them an intention. DT: Any advice for curbing habits of overacting or mugging? Performance photo by Manuel Harlan, both courtesy of Boneau/Bryan-Brown, INC.
Balanchine rehearsing Diana Adams and Jacques d'Amboise, circa 1963. Photo by Martha Swope ©NYPL for the Performing Arts. With an expansive and athletic style, George Balanchine (1904–1983) helped shape American ballet. His frequent exaggeration of classical vocabulary birthed the neoclassical movement and sparked what we now know as contemporary ballet. With technically demanding choreography that highlighted the ballerina, Balanchine developed a sophisticated approach to ballet training.